"The Wedgwood Trio formed in the autumn of 1964, at Newbold College in England where they were students at the time. Bob Summerour was from north Georgia, while Jerry Hoyle and Don Vollmer hailed from the mountains of western North Carolina. All three had grown up with a love of the region's traditional music, and when folk music became the popular idiom of the sixties, the three felt right at home with it. 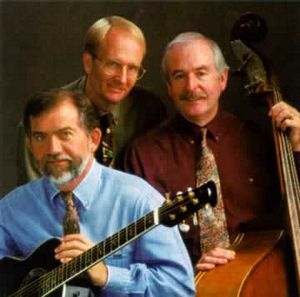 With Bob alternately on five-string banjo and lead guitar, Jerry on the string bass and harmonica, and Don on guitar, the Trio sang its way through the British Isles and Europe, and over the next five years in every part of the U.S., performing at colleges, churches, convocations, and campmeetings. The sweetness, simplicity and originality of their music endeared them to thousands, and their warm and natural stage presence made them many friends. Their songs touched the heart. Between 1964 and 1969 the Wedgwood Trio produced four gospel and two secular albums of songs popularized in their concert tours. During the late sixties and early seventies, the group was consistently in the top 10 in Christian radio play and is still heard on many Christian radio stations around the country. Late in 1969, Don left the Trio to devote himself to teaching, and the group reformed with Gary Evans taking his place. As Baby Boomers reached 40 and nostalgia for the sixties peaked, invitations to do a reunion concert began coming in. At Long Beach, California, in April of 1992, Bob, Jerry, and Don sang together again for the first time in 23 years! The response was overwhelming and the Reunion Tour was launched. In the last four years, the Wedgwood Trio has performed over 100 concerts in every part of the U.S., the Netherlands, England, Ireland, Australia, and New Zealand. Four collections of their original recordings have been released on CD and cassette. Their first new recording, Simple Truth, was released in June of 1996. Wedgwood: Their Music, Their Journey, a book by Marilyn Thomsen, was released in February 1996 by Pacific Press. A video entitled Live, Down Under, was released in February of 1998 and was produced during the November 1997 Wedgwood Trio tour of Australia. Bob is a psychiatrist, Jerry a clinical psychologist, and Don a pastor--all living within miles of each other in Southern California. But one weekend or so a month, and during their vacations, they are off together again somewhere in the world, still sharing those favorite, familiar Wedgwood songs. While the Trio is making many new friends, for old fans, hearing them again takes them back to what they remember as the best of their youth. The nostalgia is oh so sweet!"